^ Crick FH, Barnett L, Brenner S, Watts-Tobin RJ. 1961. General nature of the genetic code for proteins. Nature 192:1227-32. ^ Nirenberg MW, Matthaei JH. 1961. The dependence of cell-free protein synthesis in E. coli upon naturally occurring or synthetic polyribonucleotides. Proc Natl Acad Sci USA 47:1588-602. ^ De Pouplana, L.R. ; Turner, R.J.; Steer, B.A. ; Schimmel, P. (1998). “Genetic code origins: tRNAs older than their synthetases?”. Proceedings of the National Academy of Sciences 95 (19): 11295. doi:10.1073/pnas.95.19.11295. PMID 9736730. http://www.pnas.org/cgi/content/full/95/19/11295. ^ Freeland SJ, Hurst LD (September 1998). “The genetic code is one in a million”. J. Mol. Evol. 47 (3): 238--48. doi:10.1007/PL00006381. PMID 9732450. http://link.springer-ny.com/link/service/journals/00239/bibs/47n3p238.html. ^ Taylor FJ, Coates D (1989). 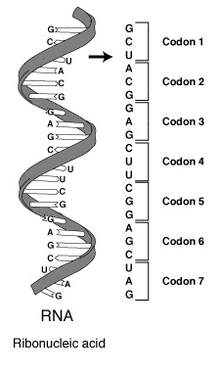 “The code within the codons”. BioSystems 22 (3): 177--87. doi:10.1016/0303-2647(89)90059-2. PMID 2650752. ^ Di Giulio M (October 1989). “The extension reached by the minimization of the polarity distances during the evolution of the genetic code”. J. Mol. Evol. 29 (4): 288--93. doi:10.1007/BF02103616. PMID 2514270. ^ Wong JT (February 1980). “Role of minimization of chemical distances between amino acids in the evolution of the genetic code”. Proc. Natl. Acad. Sci. U.S.A. 77 (2): 1083--6. doi:10.1073/pnas.77.2.1083. PMID 6928661. ^ Knight, R.D. ; Freeland S. J. and Landweber, L.F. (1999) The 3 Faces of the Genetic Code. Trends in the Biochemical Sciences 24(6), 241-247. ^ Knight, R.D. and Landweber, L.F. (1998). Rhyme or reason: RNA-arginine interactions and the genetic code.
. Molecular Biology and Evolution 19, 1645-1655. 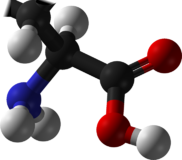 ^ Amirnovin R. (1997) An analysis of the metabolic theory of the origin of the genetic code. Journal of Molecular Evolution 44(5), 473-6. ^ Ronneberg T.A. ; Landweber L.F. and Freeland S.J. (2000) Testing a biosynthetic theory of the genetic code: Fact or artifact? Proceedings of the National Academy of Sciences, USA 97(25), 13690-13695. ^ Moosmann, Bernd; Irimie, Florin-Dan; Toşa, Monica Ioana; Hajieva, Parvana; Granold, Matthias (2018-01-02). “Modern diversification of the amino acid repertoire driven by oxygen” (英語). Proceedings of the National Academy of Sciences 115 (1): 41–46. doi:10.1073/pnas.1717100115. ISSN 1091-6490. PMC: PMC5776824. PMID 29259120. https://www.pnas.org/content/115/1/41. ^ Freeland S.J. ; Wu T. and Keulmann N. (2003) The Case for an Error Minimizing Genetic Code. Orig Life Evol Biosph. 33(4-5), 457-77.